To get things moving along quickly I am going to use the same activity that I used in the last blog to find my paired devices. This can be found here. Only one thing will change and that is the activity name. Call it DeviceListActivity, as it is no longer the main activity. // Make an intent to start next activity while taking an extra which is the MAC address. mBtAdapter=BluetoothAdapter.getDefaultAdapter(); // CHECK THIS OUT THAT IT WORKS!!! Also make sure that you update your permissions in the manifest to allow bluetooth (and the DeviceListActivity name if you didn’t start a new project from part 1). Now on to the new stuff! We are making an activity that will allow us to turn on/off an LED on the Arduino as well as receive data via bluetooth. When finished it will look like the image below. As we are sending and receiving data this time through Bluetooth rather than just sending there are a few more things to take care of. First of all is the fact that we cannot simply wait for a bluetooth message to come along on the main thread of our activity. If we did we would most likely get an ‘Application Not Responding’ message. So we need to run a new thread for the bluetooth data receiving to take place on, as well as a handler to update the UI when relevant data has been received. To get a better idea of how threads and handlers work read this. Another thing to concern ourselves with may be that we are now getting data in from our Arduino. What do we do with it!!!! If you remember from part 1, the data will be arriving in the form: #1.23+2.34+3.23+2.43+~ So from this we can use the fact that ~ is the last character, therefore the end of that transmission. # is the beginning of the transmission so we can say if the first character of the string is # we are good to go on reading the data. Finally we can work out where our data is in the string from #. The data for sensor 0 will be at elements 1-5 in the string so we can extract what we need with the use of substring. This procedure is repeated for the remaining three sensors. With that information now acquired we can use setText to display the sensor values in the corresponding textViews. android:text="Sensor 1 Voltage = ????" android:text="Sensor 2 Voltage = ????" 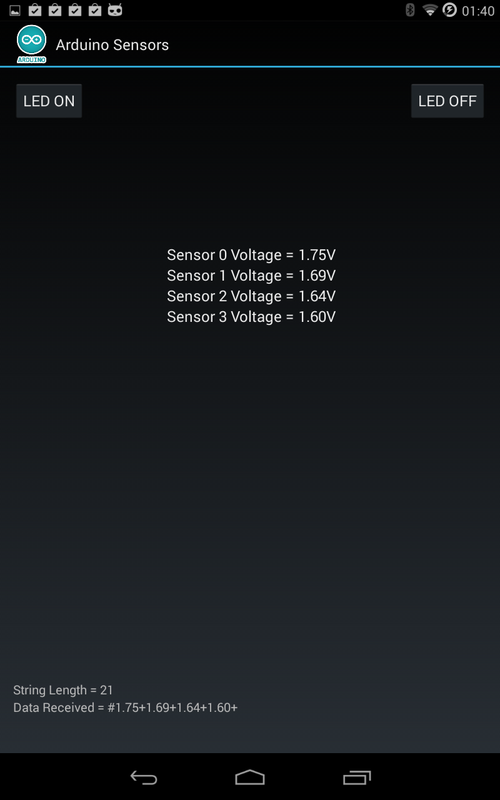 android:text="Sensor 3 Voltage = ????" android:text="Sensor 0 Voltage = ????" // Establish the Bluetooth socket connection. One small thing to add. I used to send the buffer from my run method in the connectThread but found that I would sometimes get garbled data with anything but slow data rates. It turns out this was because the buffer was getting full and struggling to keep up. A much better method is to create a string in the run method from the buffer and then send that to the UI thread via the handler. Turn on your Arduino and bluetooth module and run your Android app. If all goes well your sensor values will go from ? to voltage values. If I have missed anything give me a shout. Just a reminder that all files used are available on GitHub here. I can send data from android to arduino but canoot receive data from arduino, below is my code and almost same with your code, can you help me to correct? I try debug the code and show me the program cant run into the handler and onRun() function. // Set up a pointer to the remote node using it’s address. // A MAC address, which we got above. // Establish the connection. This will block until it connects. why i run the program, I get this message at Logcat “IOException while reading the InputStream” but i dunno where cause this error. Can I know where you call the run() function? I try your code and cant display the data in android phone, is because you do not call the run() function? I’m doing it on android studio.. But getting error on line no. 120. I didn’t get the EXTRA_DEVICE_ADDRESS thing. Where did it come from..? It’s causing me an error.. 😦 Please help me out..
I’m doing it on android studio.. But getting error on line no. 120.